“Ann Moss, Saltaire Poet” was published in 2010, writes Roger Clarke, and is an account of the inspirational story of Ann’s life as a deaf, single parent in diminished circumstances, who brought up her three children on the proceeds from the sale of her poetry. 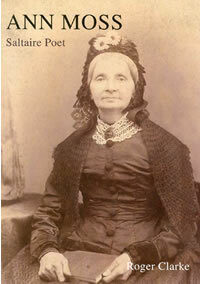 It is also a vivid description of life in Victorian Bradford and Saltaire, described in verse by Ann. Promotion of this volume in Ann’s native Ashton-under-Lyne led to contact with Mary Whitehead who, in addition to being a local historian, is also secretary of the Albion United Reformed Church in Ashton. All proceeds from this book are being donated to Saltaire United Reformed Church. This was a dual reason for Mary’s interest in researching Ann’s story further. Mary’s very comprehensive account of Ann’s references to places and events in Ashton, complete with an 1831 map showing locations. can be downloaded as an Acrobat file at the bottom of this page. A further positive development in this story is that Mary has been put in touch with Valerie Jenkins who is secretary for Saltaire United Reformed Church and there is to be more contact between the two congregations in the future. Many thanks to Mary for generously sharing her research. It is much appreciated. This is an Acrobat file and you will need Acrobat Reader installed on your computer.